Do you use the Safari browser and shop on the web often from a Mac with OS X or an iOS device? If so, you can greatly speed up your checkouts and online ordering by storing credit cards securely within Safari’s AutoFill Keychain. 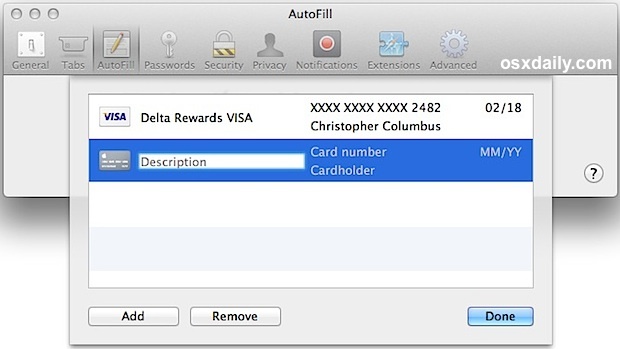 This makes it possible to instantly autofill card information when ordering on any site, and if you keep your address details in Safari’s Autofill it can make checking out with online purchases extremely fast, even on new checkout forms. Credit card data is obviously fairly sensitive, and Apple uses 256-bit AES encryption to keep the information secure. Additionally, you’ll still need to enter the cards security code (that number on the back) to complete a checkout. By default this will only store on the local Mac that it has been set up with, but if you have other Macs, iPads, and iPhones using the same Apple ID, turning on iCloud Keychain will allow the card data to be synced between your other OS X and iOS devices for quick checkouts all around wherever Safari is used. OS X Mavericks and iOS 7 or newer are required to have access to these features. As mentioned, the Credit Card AutoFill does not store the 3 or 4 digit security code on the back of a card, so you’ll either need to memorize that yourself or have the card handy to complete a purchase. That’s a good thing though, because the security code offers an additional layer of protection to prevent unauthorized usage. You can edit or remove the stored cards from AutoFill by going back into the Preferences card editor, selecting the card in question, and then either clicking in the respective field to edit, or just choosing “Remove”. Once you’ve added the card information, you can decide whether you want those details shared securely between your other Apple hardware using iCloud Keychain, which also offers secure password storage, syncing, and generation, and login syncing across iOS and Mac hardware, making it a great all around feature to use. 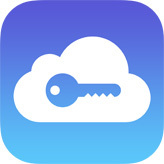 This obviously requires an Apple ID with iCloud, which just about every Apple product owner should have by now. If you already have iCloud Keychain enabled, you don’t need to do anything to get the information to sync across to your other devices. Assuming you have iCloud Keychain enabled, this will also sync to your other Macs and iOS devices using the same Apple ID, and accessing the autofill data is the same on every machine. When Safari detects an order form with credit card information required, you’ll have the option to autofill with the card(s) you entered when you click a “Credit Card” field on any website. As always, be sure to safeguard your devices that contain personal information, which is pretty much every one of our devices these days. Whether logins and passwords, emails, credit cards, or just your personal documents and files, taking simple security precautions like requiring logins to use a Mac, or a passcode to access an iOS device, should be considered a bare necessity for all users. We routinely cover security tricks both simple and advanced for Apple products, so if you feel like taking extra precautions it may be worth your while. You people are out of your damn minds. I will never leave a credit card number to auto-fill on anything in the web.I want to manually fill out the number ANYTIME I use it. What idiots. It is NEVER a good idea to have credit card information stored in auto-fill. Yeah I think I’ll leave it for the time being… but saying that, most of us still keep passwords in there, & for credit cards you still need to enter your security code to make a transaction. I did read about an exploit that meant contacts could be got at through autofill. One would assume that, since these things come to light, they are quietly patched by Apple & pushed in the next updates?